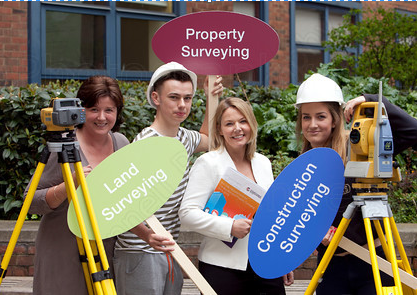 The Society of Chartered Surveyors Ireland (SCSI) in conjunction with DIT Bolton Street has launched ‘Surveying Week’ (April 28th to May 2nd) to highlight to transition year students in particular the employment opportunities which exist in the property and construction sectors. To mark the week the SCSI published a new report ‘Employment Opportunities and Skills Requirements for Construction and Property Surveying 2014-2018 Report’ . Pictured (L-R): Helen Murray (Lecturer, School of Surveying and Construction Management, DIT Bolton Street); Jordan Gribbin (Transition Year Student); Ciara Murphy (Director General, SCSI); and, Gwen Sizun (Transition Year Student). Monday 28th April 2014. The Society of Chartered Surveyors Ireland (SCSI), the professional body for estate agents and construction professionals has warned of a shortage of qualified graduates coming into the industry which could threaten the pace of recovery in the property and construction sector. A new report entitled ‘Employment Opportunities and Skills Requirements for Property and Construction Surveying 2014’ shows that, based on a conservative forecast of economic growth up to 2018 (2% growth p.a. ), almost 1,110 new employment opportunities are expected to arise across the surveying professions over the coming 4 years. While the property sector is already experiencing a shortfall in graduate supply, the demand for Quantity Surveyors and Building Surveyors is increasing and there is likely to be a 25% shortfall of qualified graduates due to very low CAO applications in recent years. The report was launched at the start of the first ever ‘Surveying Week’ by the SCSI and Dublin Institute of Technology. Dr Roisin Murphy and Mr Stephen Walsh from DIT were commissioned by the Society to undertake the research report that included a survey of 400 construction and property firms nationwide. The report notes that if the economy recovers faster than expected (3% per annum), 2,360 new opportunities could arise but based on current enrolments1,525 or 65% of these new posts would not be filled by Irish graduates. This could restrict the capacity of the construction industry to meet demand for house building and infrastructural projects and property professionals to sell, let and value property. Ciara Murphy, Director General of the Society of Chartered Surveyors Ireland (SCSI) said; “the significant decline in CAO applications for property and construction surveying courses mirrored the fall in activity in the industry. However, as activity levels have improved in the property market, particularly in urban areas and with construction output expected to grow by 30% over the coming 4 years, the lack of new graduates entering the profession is a major concern for employers”. “No-one wants to return to the levels of output of €37bn witnessed during the boom. Output levels stabilised at €8bn last year and are projected to grow year on year. That means there will be a shortfall of qualified graduates entering the sectors which will put pressure on employers to meet the capacity requirements expected over the coming years” Murphy said. According to the report 66% of the firms surveyed were paying graduates salaries of between €20 to €30K, while 5% reported graduate salaries of €30 to €40K. “Our courses are producing excellent graduates, but we need to ensure we have an adequate number of them to safeguard our skills base, to maintain our competitiveness and to underpin the steady sustainable growth we want to see in the coming years. On a practical level this means ensuring that our construction companies have adequate numbers of qualified staff to build the homes, offices, health and educational facilities we need. “The findings clearly demonstrate that there are well paid jobs for graduates in the property and construction sector, which people may not have realised, and that a career in the sector can offer high levels of mobility, job satisfaction and international opportunities” Murphy concluded.